The 5-string banjo is considered one of bluegrass’s most important and historical instruments, and is one of the most easily recognized instruments in the world. The banjo itself can be traced back to Africa, where they were made using animal skins and gourds as the base. 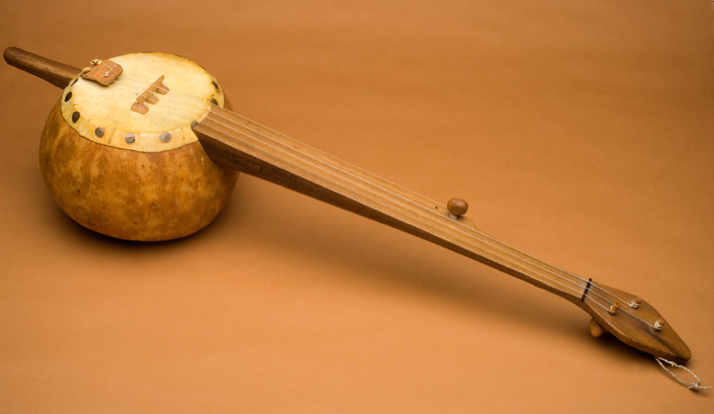 A stick was used as the neck, with no frets or fingerboards, just acting as a holding element for the strings over the skin. Unfortunately, the banjo was spread around the world as a by-product of the slave trade. As African slaves were moved around the world, they brought their music with them, and it blended and evolved as they encountered new things. Exposure to European instruments like the lute and Spanish guitar led to a fretboard being added to the neck of the banjo in the Caribbean islands. The banjo later became a regular part of slave life on plantations and farms in the U.S., and drew the attention of white performers. One of these performers was Joel Sweeney from Appomattox, Virginia. An early black-face performer, Sweeney was one of the first minstrels to use a banjo as a regular instrument on stage in recurring shows. He is also credited with creating the drum-like resonator seen on modern banjos. Another major addition to the banjo was the addition of the fifth string. The banjo’s fifth string is different in that it starts at the fifth fret and is tuned to a higher open pitch then the other four strings. This is a key part of the playing style of the banjo, relying on rolls and re-entrant tuning to create its distinctive sound. After the popularity of bluegrass and old time music, the banjo continued to evolve in several different variations. The tenor banjo, which features a shorter neck and higher pitched tuning, allows a banjo player to simulate the sounds of a mandolin or fiddle. Large scale versions of the banjo were also created, such as the cello and bass banjos, even including a stand up bass banjo. Finally, the banjo has also advanced into the electronic instrument market, with electric banjos making their way into modern electric bands and alternative bluegrass music.